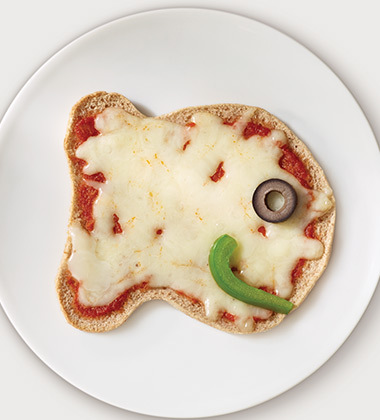 Made with mozzarella and tomato sauce on warm 100% Whole Grain Goldfish bread, this pizza smiles back with a black olive eye and green pepper smile. part skim mozzarella cheese, shredded	 3 lb. black olives, pitted, sliced	 4 oz. green pepper, cut into thin strips	 5 oz. 1. 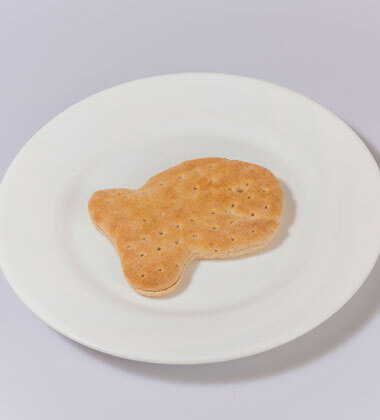 Split each portion of Goldfish Bread in half, and place split halves on a parchment-lined sheet pan cut side up. 2. Using a 1 oz ladle, measure and spread 2 Tbsp of Prego Italian Pasta Sauce onto each half of bread. 3. Use a #16 scoop to portion 1 oz (1/4 cup) mozzarella cheese on top of each bread half. Distribute cheese evenly over the surface of the bread using the back of the scoop. 4. Add 1 olive slice to make a fish eye, and 1 green pepper strip to make a mouth on each topped bread half. 5. Bake in a pre-heated 350 degree F oven for approximately 15 minutes or until the cheese has melted. 6. Serve Immediately, or hold for hot service at 140 degrees F until served. 1. 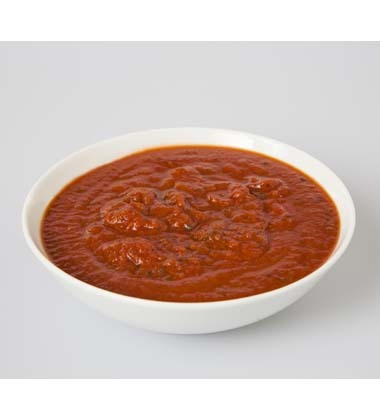 Use a #16 scoop to portion 1/4 cup of Prego Sauce into 2 fl oz serving cups. Put lids on cups. 2. Use a #8 scoop to portion 1/2 cup (2 oz) of shredded cheese into 4 fl oz serving cups. Put lids on cups. 3. Put 2 sliced olive halves and 2 green pepper strips in 2 fl oz serving cups. Put lids on cups. 4. Put 1 portion of Goldfish Bread, 1 filled sauce cup, and 1 cup with vegetables in each serving container. 5. CCP: Serve immediately, or hold for cold service at 41 degrees F or lower until served. 6. Post a picture of an assembled menu item OR display a sample assembled Cheesin Pizza on your serving line to inspire students to create their own. part skim mozzarella cheese	 3 lb. 3/4 cup (about 4 oz) of black olives, sliced in half, provides enough olive slices to make 24 portions of this recipe. 1-1/2 cups (about 4-1/2 oz) of sliced green pepper provides enough olive slices to make 24 portions of this recipe. For a complete reimbursable school lunch for grades K-5, offer this menu item with an additional 1/4 cup vegetables, 1/2 cup fruit, and 8oz of milk.